If you would like to join me as I cook my way through a cooking school curriculum (currently Basic Pastry), send me an email with "Whisk Wednesdays/Whenever" in the subject line. I'd love to have your help, feedback, and input! Each week (if possible), we'll post what we've been working on for the "class". I will post the page numbers of the base recipes that you can use or adapt in my current post. 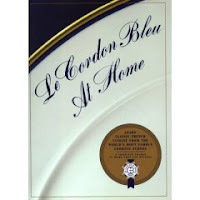 • You must own the book Le Cordon Bleu at Home. • You must post regularly. If after two months you haven't posted a recipe from Whisk Whenever, then we'll remove your blog from the blogroll. • You can post the ingredients, but the method is under copyright. Readers should be inspired and encouraged to buy the book. Through the Tuesdays with Dorie bake-along-blog, I found sweet, friendly, ambitious, and busy Kayte (from Grandma's Kitchen Table) who was interested in joining me. And what a mover and shaker she was. She got us organized, bouncing ideas back and forth through email since she lives in Indiana and I live in Canada, and we cheered each other on to get this up and running. She even enlisted a friend of hers, Shelley, who has a wonderfully written blog called InsomniMom. I look forward to reading their posts for Whisk Wednesdays and in-between! Thank you two for joining me. And now we have more members! Check the sidebar to see the current list of members! I love your blog! I went to Le Cordon Bleu. I have that book. LOL I know that curriculum! Hopefully I'll get to join in from time to time. I hate hollandaise but I love love love bearnaise. I think it's the tarragon. I'm in. I just bought the book, and I'd liek to join. With Kayte's encouragement, I will join. I need and want to join something like this, that helps me to understand basic french sauces/cooking and build an appreciation for cusine. Thank you for starting such a fantastic group. My husband is a wine maker, and I learn from him about all things wine, but my main focus is wine pairings, and I would love to be bale to pair my meals from Whisk Wednesdays with wine recommendations on my blog. That's a good question. Thanks for asking. Since the focus is on Bearnaise sauce, you don't even have to do the artichokes if you don't want to. Substitute what you like; asparagus sounds good! Have fun. I just bought the book and will be joining in a week or so. I am excited and I love...love cooking with sauces!